French cinematic icon Agnès Varda, as I noted about her beautiful 2008 documentary self-portrait, The Beaches of Agnès (Rendez-Vous 2009), likes to be told what she wants to hear. So rather than a "documentary" her new film made with 33-year-old photo installation artist (or photographer/muralist) JR is best seen as aa beautifully staged presentation. It is a showcase for her and JR. In fact they work out a duo act, and a very smooth one it is. They join up to travel around France doing what he does. He has a Mercedes van painted to look like a giant camera, in which he can quickly process photographs and make very large prints suitable to be plastered on walls, which is what they do. 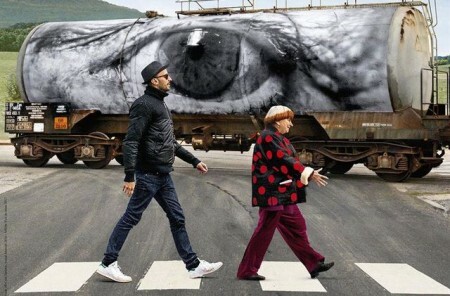 Along the way the 88-year-old but very vigorous (if fragile) Varda calls the shots. And in any case, she is the star, the little stocky woman draped in scarves with the casque of hair, half white, half dyed (this time) a reddish brown. If anyone objects to this plastering of big photos on walls for legal or personal reasons, it's not shown. If this sounds like objections to Varda or JR or their film, they're not. Visages, Villages is a charming, rather magical little film, and a portrait of French niceness. Everyone in this film is polite, good tempered, and friendly. Vive la France! This Tour de France has some of the childlike charm of Michel Gondry's films and is admirable for its purity and simplicity, a celebration of the transitory, of faces and places, of photography and the amiable and attractive defacement of property by artistic people. The narration of Visages, Village is a running dialogue of JR and Agnès. They too are unfailingly nice - in one conversation he explains why he likes older people, and so, her - she's a little feisty, objecting to a compliment on her wrinkles (when her eyes and her hands get the giant-photo treatment, pasted on freight cars), and to a friend being called "an old friend." They visit JR's 100-year-old grandparent (she hasn't that much to say). Old age is a topic: Varda says she is ready to go and thinks a lot about death (but there's nothing gloomy about this indomitable femme). JR has a team of assistants, but on the trip we don't get to meet them, only JR, in his hipster hat and highschooler clothes and perpetual shades, which Varda keeps nagging him to take off (eventually he does, but we see his eyes as a blur, because her vision is blurry). We see the pair traveling in the van. They may not be alone in it and surely don't sleep in it, but where they sleep isn't shown. How JR makes his prints and what kind of prints they are also isn't shown or explained. They go around pasting large photos on façades of (usually old) buildings, in the country, in "villages." Once the face of a woman who's the sole remaining inhabitant of a row of devastated houses is pasted on the façade of that house where she remains. (She is moved. )The photographic paper seems thin and it fits between the cracks of a brickwork front. They meet a farmer who talks about how agriculture has changed. He enjoys helming a tractor with lots of computer gadgets, but misses the other farm hands, who now aren't needed. JR does his portrait, and puts it on a barn-like structure. Later JR and Agnès visit and photograph goats and goat farmers. The trend is to burn off their (the goats') horns at an early age. This means they don't fight and promotes milk production. But they find a lady who keeps the horns on her goats. They're meant to have them, she thinks. So what if they fight? JR does a giant photo of a goat with horns that goes on a wall, to remind folks goats have horns. The goat farming lady also used to use milking equipment but got rid of it. She didn't like the noise it made, and realized that hand milking was a peaceful time, not to be lost. Varda likes this independent lady. She also likes three dockers's wives met at Le Havre. One drives big rig trucks. Their giant photo portraits get pasted on tall networks of boxes and then the three women are posed up in spaces where boxes were. These are art pieces, sometimes temporary ones, like Christo and Jean-Claude's. Such is the photo portrait Varda took of artist and photographer Guy Burdin, his full length, bent in a sitting or lying pose, blown up by JR and mounted on a fallen-down German bunker on a beach. But this time the tide, after one day, washes away the photo portrait. So this is a sign these pasted-on photos, though they look monumental, may wash away in strong weather, like so many interesting pasted-on graffiti on the walls of Paris - for JR's methodology is not unique, though his works are accomplished and impressive. Varda chose well, or they chose each other well, for her fame enhances his through this film. This is a photographic tour, so it is fitting that the duo makes a visit to a small cemetery at Montjustin to pay homage to the greatest of French photographers, Henri Cartier-Bresson, and his second wife, Martine Franck. The finale, a surprise to JR (supposedly, anyway: some of their conversations may be staged), is a train trip to Switzerland to see Jean-Luc Godard. He gives them the cold shoulder, leaving a note but not answering the door. Agnès, who was close to him once, and saw him five years before, is angry but still says she is fond of him and recognizes his eminence as a cinematic innovator. This also becomes a ritual, because they leave a bag of pastries on the door and write a message. They pay another homage to Godard, recalling the race-through-the-Louvre scene of his Bande à part by racing through with JR pushing Agnès in a wheelchair. How it all ends I don't remember: it just ends. So it is with road trips, one thing after another, and then the end. But JR and Varda are still around and came to the NYFF to talk about their work, as they have at other festivals.